Earlier this year, Sundar, Prasad, Tiwari and Parate were part of a fact-finding team that looked at the impact of Maoist violence and state excesses on ordinary villagers in Bastar. New Delhi: Delhi University professor Nandini Sundar, whose PIL against human right violations in Chhattisgarh led the Supreme Court to ban the notorious Salwa Judum vigilante movement, has now been charged by the police in the state with ‘murder’ along with other scholars and activists, PTI reports. “An FIR was lodged against DU professor Nandini Sundar, Archana Prasad (JNU professor), Vineet Tiwari (from Delhi’s Joshi Adhikar Sansthan), Sanjay Parate (Chhattisgarh CPI(M) state secretary) and others along with Maoists for the murder of [a villager] based on the complaint of his wife on Saturday,” inspector general of police (Bastar range) S.R.P. Kalluri twas quoted as saying. They were booked under section 120B (criminal conspiracy), 302 (murder), 147 (punishment for rioting), 148 and 149 of the IPC at Tongpal police station, Kalluri said, adding, “strongest possible action will be taken against those guilty after the investigation”. Armed Naxals allegedly killed a villager, Shamnath Baghel, with sharp weapons late at night on Friday, November 4, at his residence in Nama village under Kumakoleng gram panchayat in Tongpal area, around 450 km from Raipur. Baghel and some of his associates were reported to be spearheading the protest against Naxal activities in their village since April this year. “As per the complaint lodged by the victim’s wife, her husband had been getting threats from Maoists since he and other villagers had complained against Sundar in May this year. Even armed ultras were referring to that complaint and anti-Maoist demonstrations while attacking Baghel on Friday,” the IG said. His wife has sought action against Sundar and others accusing them of murdering her husband, Kalluri added. Baghel and other villagers of the region had earlier filed a complaint at the Tongpal police in May this year against Sundar, Prasad, Tiwari, Parate and an unidentified woman activist from Sukma for allegedly inciting tribals against the government and seeking their support for the Maoists. Sundar and others had strongly refuted those charges at the time, and accused the police of fabricating the charges as part of its pressure tactics against scholars and activists documenting human rights abuses in the state. According to Kalluri, villagers from Nama and the neighbouring Kumakoleng village (both under Kumakoleng village panchayat) had started a “self-motivated protest” against Maoist activities in their villages after forming their own security group named “Tangiya (axe) group” in April this year. He alleged that Sundar and others had “threatened” the villagers not to oppose the Maoists – an accusation the scholars denied. Earlier this year, Sundar, Prasad, Tiwar and Parate were part of a fact-finding team that looked at the impact of Maoist violence and state excesses on ordinary villagers in Bastar, finding that they were not only victims of fake encounters, rapes and arrests (by the police and security forces), beatings (by both police and Maoists), IED blasts and killing of informers (by Maoists), but were also increasingly falling prey to a new form of Salwa Judum. Scholars, activists and opposition parties have alleged that the police has been harassing the researchers, creating baseless charges and trying to intimidate them for bringing out major human rights abuses in the region. 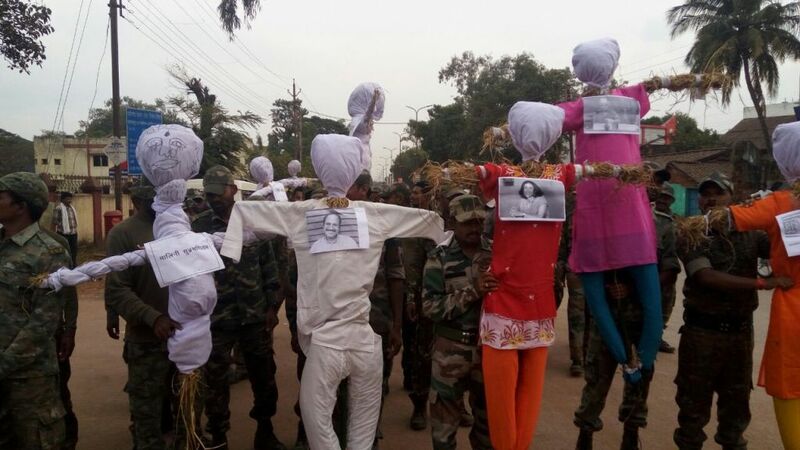 Last month, the police and security forces in Chhattisgarh reportedly burnt effigies of activists, petitioners and a journalist, including Sundar. Sundar’s book on the conflict in the region, The Burning Forest: India’s War in Bastar, was released last month.